From March 6-9, eight Harker upper school students joined thousands of students from around the world in New York City to participate in the National High School Model United Nations conference, the world’s largest Model United Nations conference for high school students. Harker students represented a variety of nations in a number of specialized committees, debating international issues and trying to work to diplomatic solutions. While the conference deemphasizes awards, it does recognize several delegations for their exemplary work in research, country representation, communication and diplomacy. 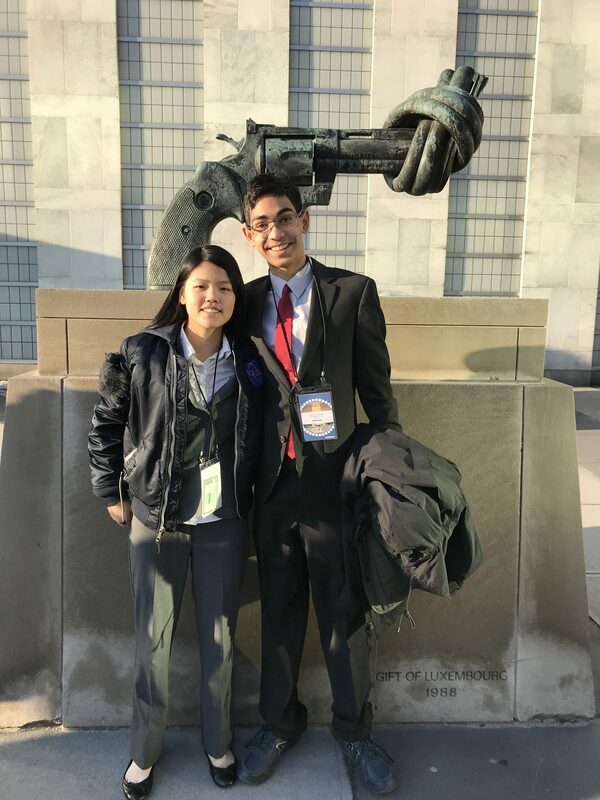 Seniors Logan Bhamidipaty and Helen Yang were recognized as the top delegation, as the sole recipients of the Award of Distinction, for their work representing Indonesia in their security council body. The conference also included keynote speeches from ambassador Jonathan Cohen, acting permanent representative of the United States to the United Nations, and Anucha Browne Sanders, UNICEF’s chief engagement, advocacy and global programs officer. The students also engaged in committee sessions full of lively formal and informal debates and negotiations. For some students in specialized committees, such as the security council, this also included a middle-of-the-night crisis committee meeting.